Here are the latest blocks I've completed for the various bees that I am participating in. First up is a tall, sweater wearing girl for Wendy. I used light weight washable yarn for the sweater portion. And here's a block of pluses and minuses for Amanda. 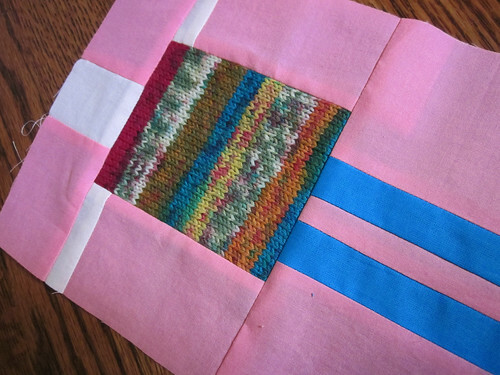 A textured block with a pop of color for Sarah (full shot of block was blurry so here's just a snippet of the block). 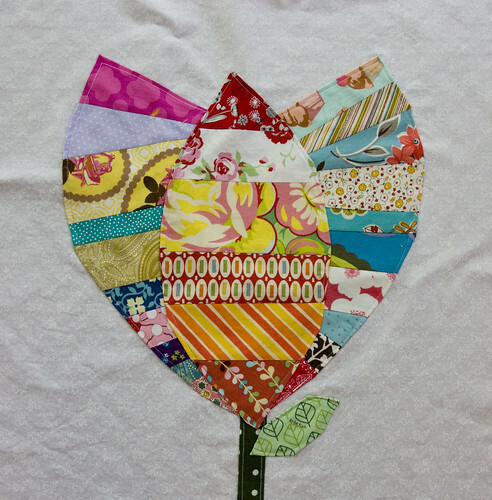 A tulip block for Penny. And Spiderweb blocks for Natalie. 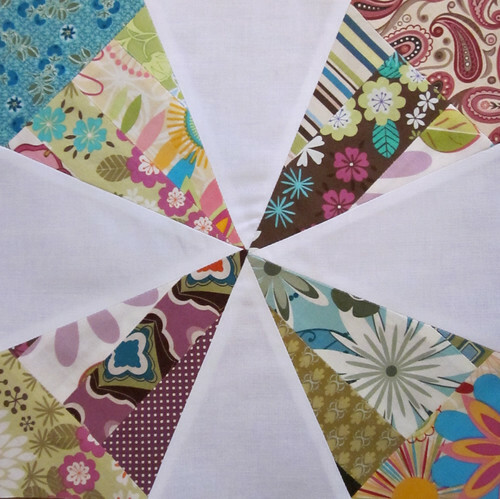 A few months ago, Rossie invited me to join the new bee she started with Cheryl (of Naptime Quilter). The bee is based on the mid-century modern design aesthetic and all of the blocks will be mostly improvised and pattern free. 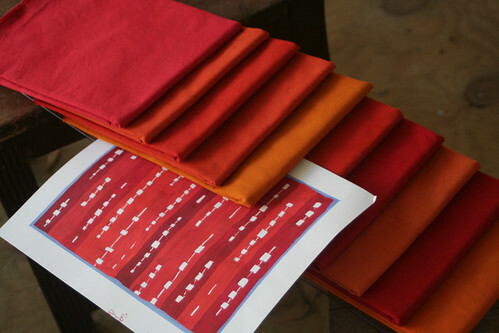 Her concept for the month is creating a kelp quilt with these varying shades of red and orange fabric that she flat dyed (simply robin tutorial here). Here's the kelp block I made. The hand dyed fabric was really fun to work with. 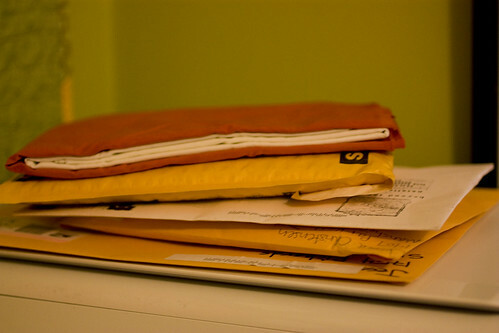 It's so saturated and full of interesting little variations. My college roommate, Emily, is expecting her first kid in September, and I've been planning on things to make for this this baby girl ever since I first found out she was expecting. After all, making baby stuff means getting to work with cute prints and small projects, so it's easy to go a little bit overboard. ...I made some bibs and burp rags. 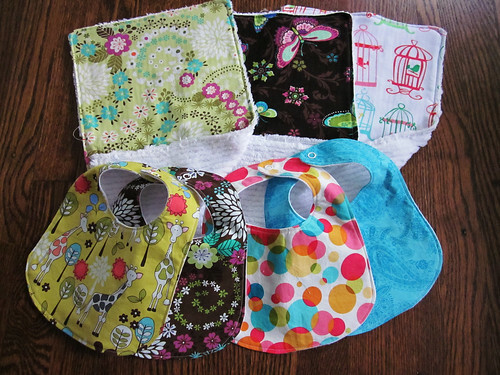 The bibs are backed with white flannel and the burp rags are quilting cotton backed with chenille and are 12"x18". I used the same fabrics that I used for Chikage's baby gifts, and was able to get one bib and one burp rag out of a fat quarter (with a small scrap left over). 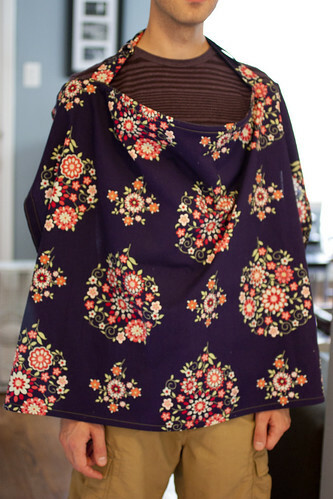 ...I sewed a nursing cover (tutorial here). My fabulous male nursing cover model is back in action! I finished 20 minutes before Emily stopped by for a little visit. Thank goodness I had the fabric cut out in advance or I never would have finished it in time. ...and I made this quilt/blanket. The fabric for this is the Porcelina line by Michelle D'Amore from Marcus Fabrics. I actually purchased this before Emily found out that she was having a girl because it totally screamed "Emily's daughter," so I was really happy that she found out she was having a girl so I'd have a chance to use it. 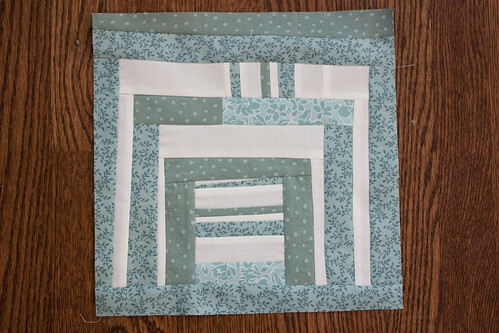 I stalled making the quilt because I was trying to come up with the perfect pattern to use for the quilt. 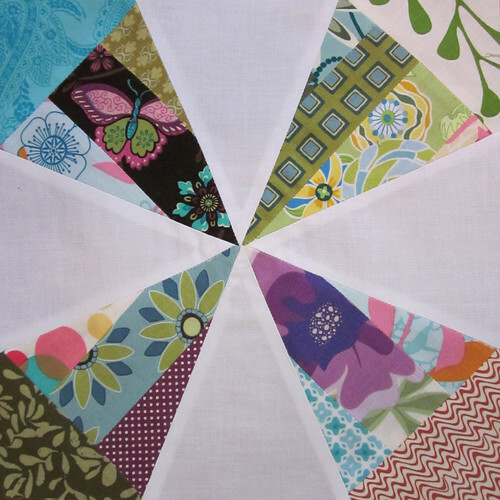 I had toyed with using a raw edge circle applique pattern, but raw edge circles are a bit too unfinished for Emily. 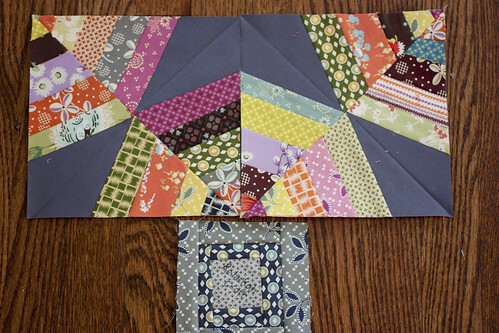 I was going to do a simple charm square patchwork, but wanted to step up the patchwork for this. 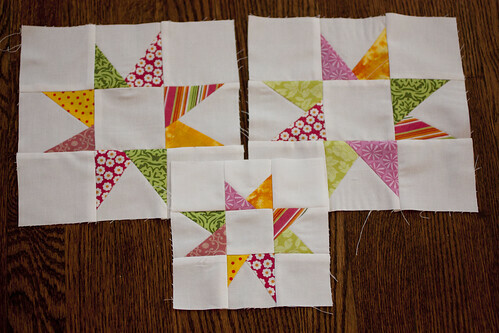 Then I narrowed down the piecing options to a disappearing nine patch or a box in a box, which I ended up using. 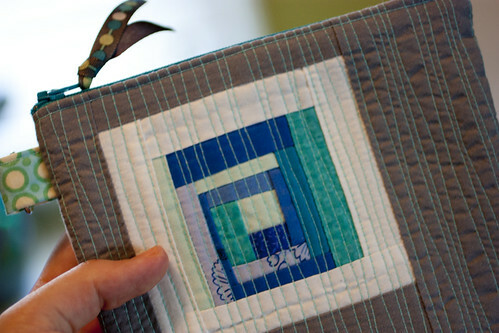 I went with the box in a box because the dimensions in this tutorial created the right size square for the size backing I was using. 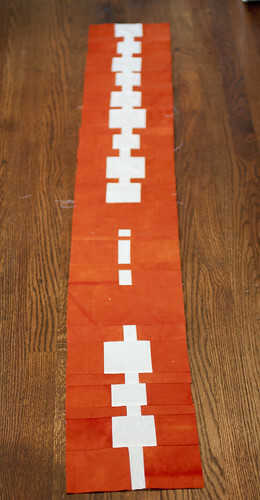 For the backing, I used a 32" x 35" piece of minky fabric. 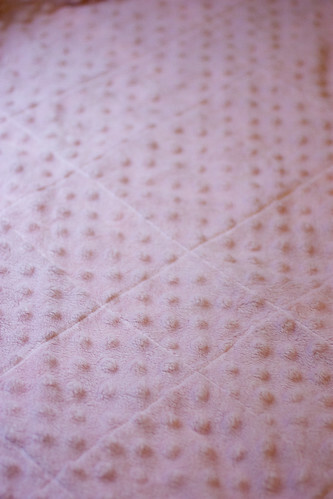 This is my first time working with minky and I was afraid that it would pucker or bunch weird when quilting because it is so stretchy. Based on the recommendation of the quilt store employee, I stretched it out on the floor, taped it down and applied a generous amount of spray baste. 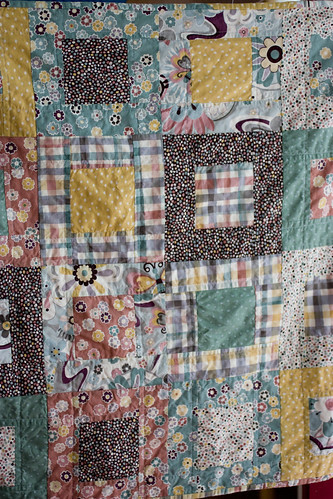 Then, I laid the patchwork top on the minky and pressed it down with my hands. 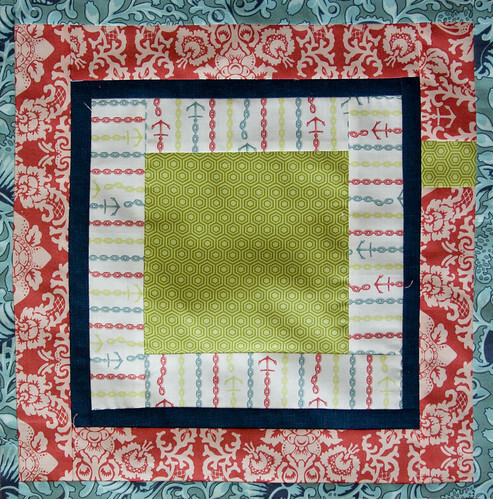 I quilted it with a walking foot in the same way that I quilt normal quilts with batting and a fabric backing. 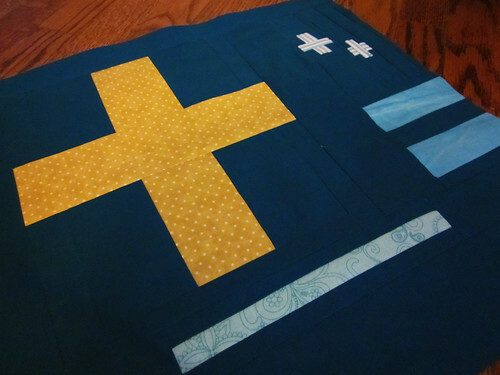 I tried to minimize the amount of quilting I did, because I didn't want to pull on the backing too much. 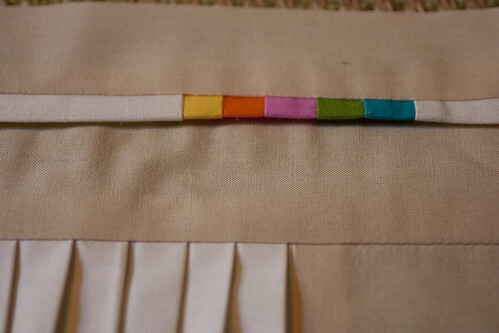 I made a scrappy patchwork binding with each of the fabrics included in the quilt and attached the binding using this technique. The finished blanket has a really light drape to it and the backing is so soft and cuddly. Now I want to make a grown up sized blanket with a minky backing like this. In an attemp to relax and enjoy life more this year I will refrain from creating a list of 29 things to do before I'm 30. It's killing me not to make a list though! This morning Jon treated me with a Nook and chocolate chip waffles. 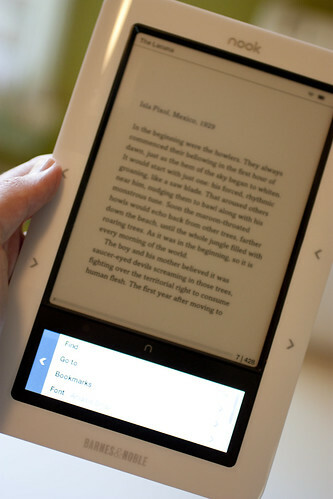 I hadn't ever considered getting an eReader until I realized that with the Nook you can borrow ebooks for free from your local library if they participate in the Overdrive program. I've checked out The Lacuna, Going Bovine, and American Taliban and hopefully I'll be able to finish all three before they're due in 21 days. 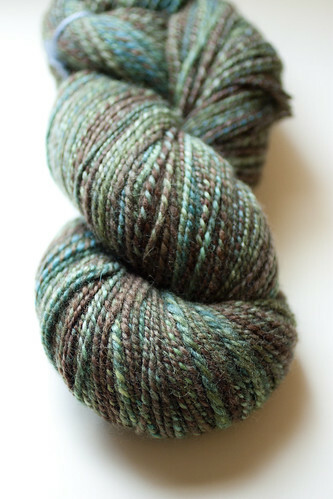 My friend, Harriet (find her on ravelry here), treated me with this amazing handspun skein of yarn (details here) that was such a fun surprise in the mail. Can you believe she's only been spinning for a few months? 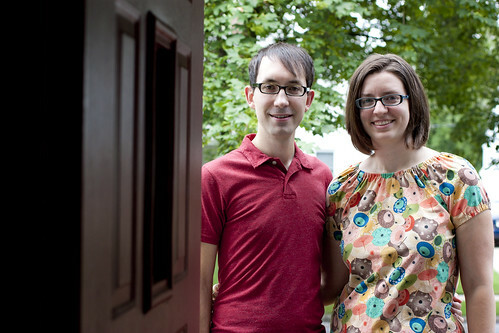 We met back in high school band and are very good at enabling each other with supplies crafty hobbies (I didn't think I was a band geek until I realized that I met all of my friends in marching band...busted!). If we follow our track record, she will be weaving and I will be spinning by the end of this year. And, the best treat of all was finishing my urgent crafting to do list. That's right, I finished all 5 of my bee blocks, my Paper Bag Challenge Project for the Brighton Modern Quilters meeting tomorrow night, and my Doll Quilt for DQS9. It was a busy sewing day yesterday and this afternoon! I'll be sharing everything later this week. - I finished knitting and blocking my Hela cardigan. I tried it on for kicks and nearly died of heat stroke. 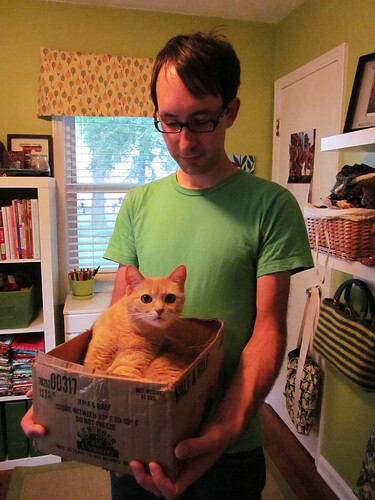 The words "Get me out of this thing" may or may not have been yelled to Jon during the process. 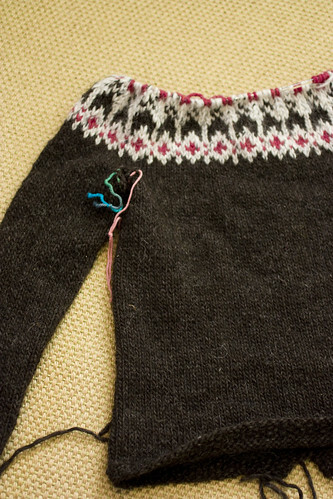 Once I pick out a zipper, I'll begin the steeking process. 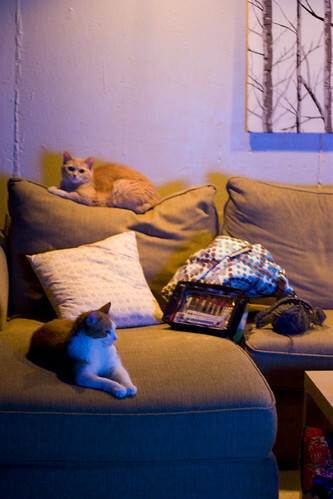 - I (along with the kitties) cast on for Jon's Icelandic Sweater, Stapi, last Wednesday, but have not touched it since. He picked out the yarn colors and pattern on our trip to Toronto in March. - Jon and I discovered the most fabulous ice cream bars! 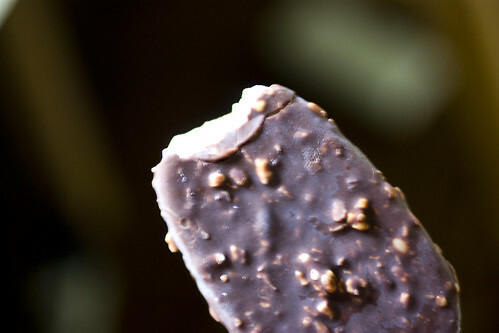 If you like Almond Joy, you'll love these So Delicious Dark Chocolate Almond Coconut Bars. Yum Yum! 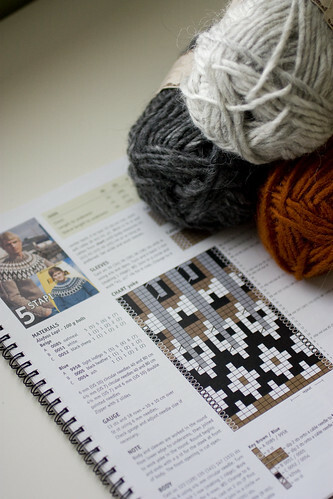 - I'm a bit behind in my bee blocks, so I'm going to be busy this weekend playing catch up. If all goes well, 3 out of 5 of these will be on time! 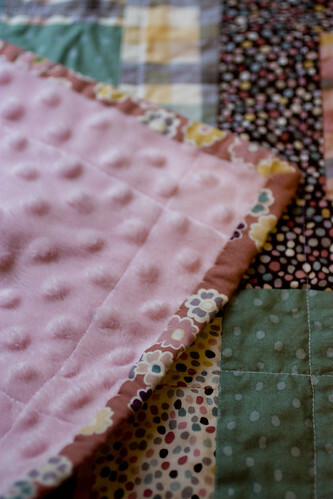 - I'm also participating in the Doll Quilt Swap #9 this year. My partner likes bright colors and graphic designs, so it's right up my alley. 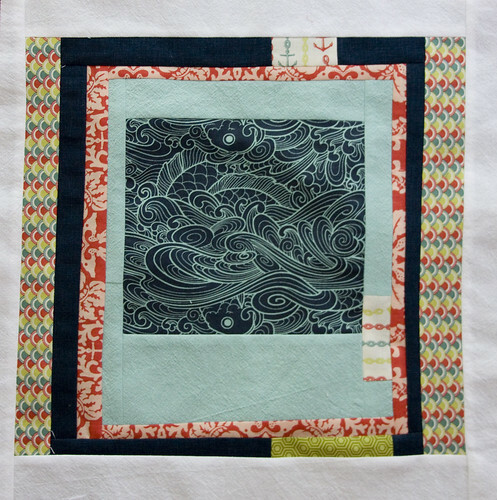 I've been tossing around ideas in my head for quite a while now and hope to finish up the quilt this weekend. 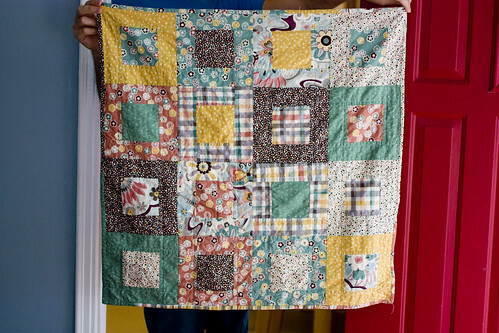 My quilt from round #7 was featured on Angela's favorites list on the Doll Quilt Swap blog last week. Thanks, Angela! 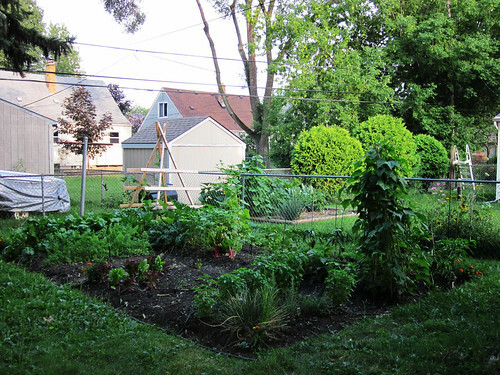 The garden is finally starting to fill out! 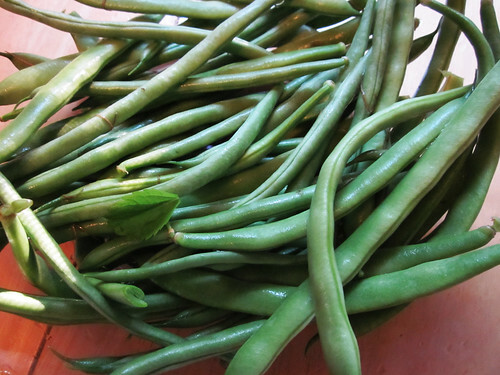 We're getting lots of cucumbers, zucchini, beans and peppers these days. It's always nice to go outside to pick dinner for the evening. Jon made a delicious green pepper and onion stir fry the other night and I'm dreaming about it again for dinner tonight. I've been a bit lazy about training the squash plants, but I was able to tie them up on Sunday and now the butternut and spaghetti squash have almost reached the top of the trellis. Next year, I will be on the lookout for vining zucchini and summer squash. 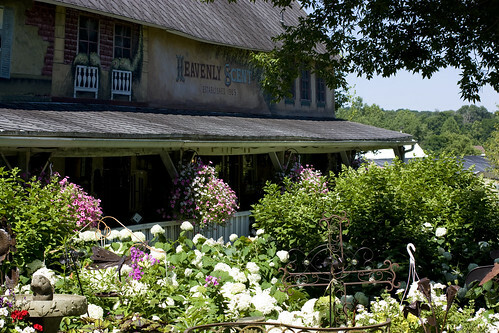 My mom and I took a mini day trip up to Fenton, MI to visit Heavenly Scent Herb Farm. If you love looking at pretty flowers, gardening, or visiting cute boutiques, this is the place to go! 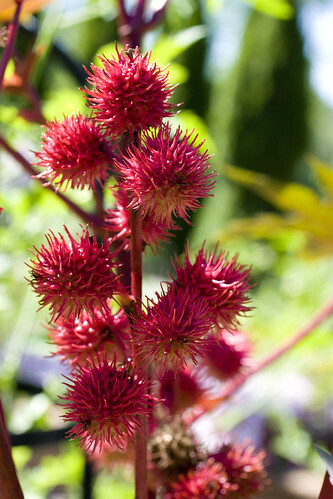 The store is filled with herbs, fun kitchen tools, gift books, and home decor. 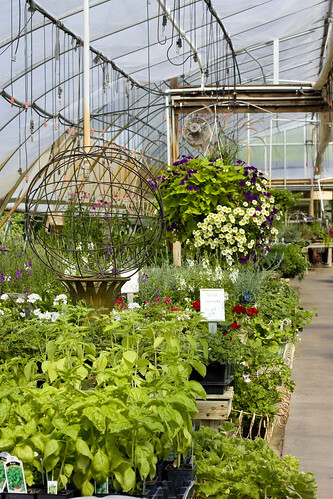 The greenhouse is filled with lots of basic herbs, plus a few unusual varieties thrown in for good measure. 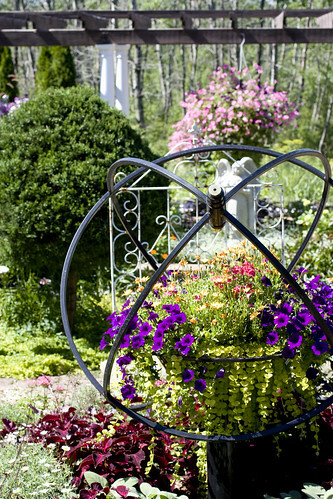 I loved this shade container garden. I think it's the first time begonias have ever looked pretty to me. 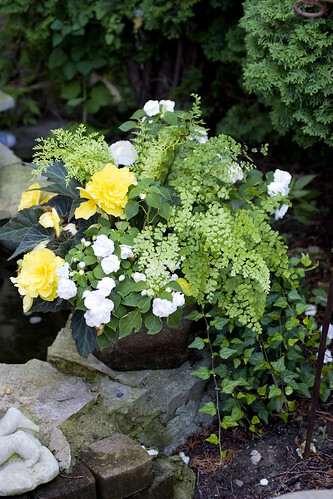 There are begonias, double impatiens, ivy, maidenhair fern and one other type of fern in this container. One part of the garden has this giant flower kaleidoscope. You can twist the kaleidoscope to see the flowers in front of it form really pretty fractured images. I loved this area of the gardens most. 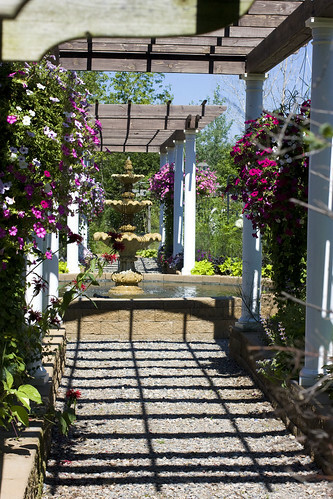 The pergola and fountain look so formal, but the raised beds on either side are actually vegetable gardens. 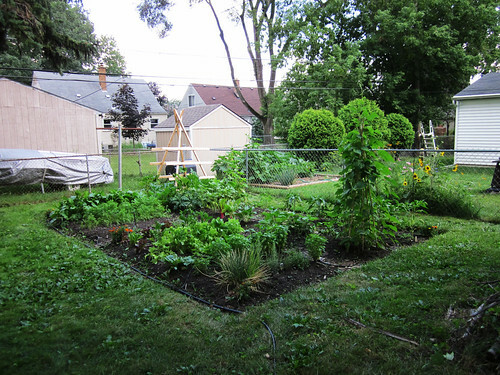 It's definitely the prettiest veggie garden I've ever seen! 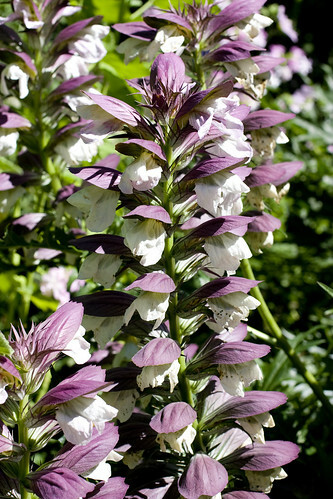 Here's a picture of my favorite flower (an honor also shared with Baptisia) - Bear's Breeches. If you're in the area, definitely stop by for lots of inspiration! They have a Summer Faire coming up at the end of August with lots of artisans, workshops and a delicious catered lunch. My mom and I will be returning to visit soon. 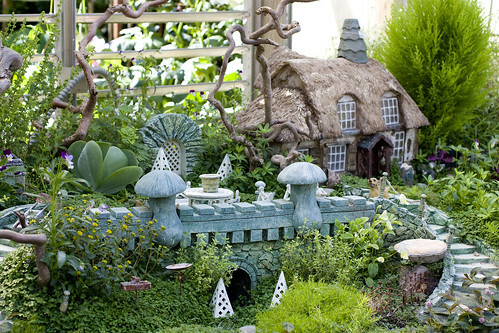 You can see the rest of my photos of the gardens on flickr here. After visiting the farm, we stopped at The French Laundry for lunch. I didn't take any pictures at the restaurant, but it's a fun mix of Zingerman's Deli and a typical French Cafe and the food was delicious. They even had several vegetarian sandwiches on the menu, along with lots of soups and salads. 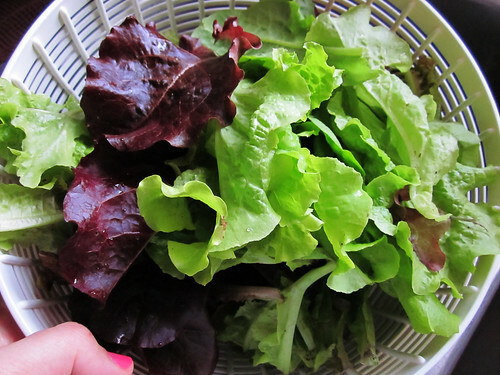 The garden is in full production this week! 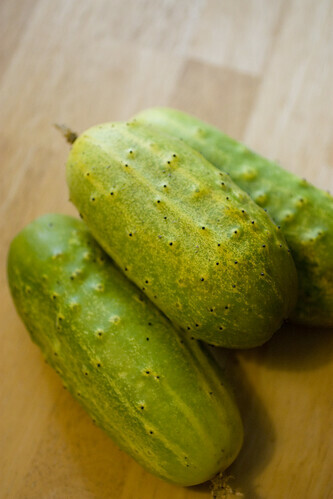 and cucumbers! Here's how they looked 5 days ago. 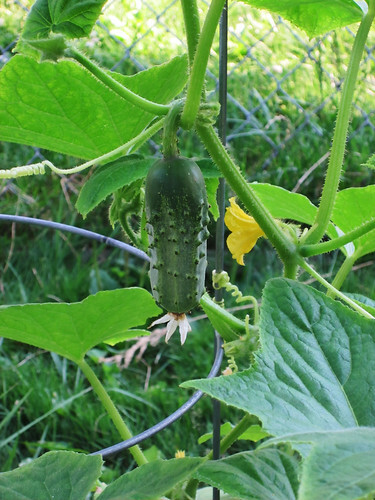 I think I shrieked when I first spotted this little vegetable on the vine. Here's how they look today post-picking. Now I need to do a bit of weeding, train some of the squash up the wooden trellis, and pull out some of the spent plants (mesclun, bok choy). The first thing that comes to mind when you think heat wave is "let's bake something in a 475 degree oven," right? After a tough first day back at work on Tuesday (emergency data recovery anyone? ), Jon was in serious need of some food for the soul. 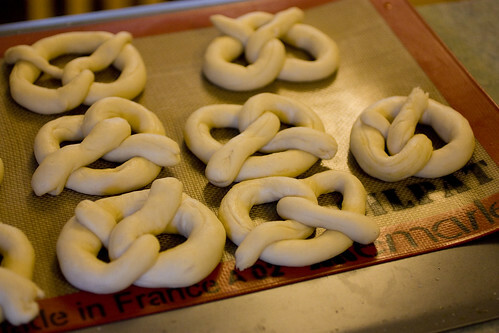 I found this recipe for soft pretzels on Tuesday night, so Jon and I made a batch of pretzels to try. 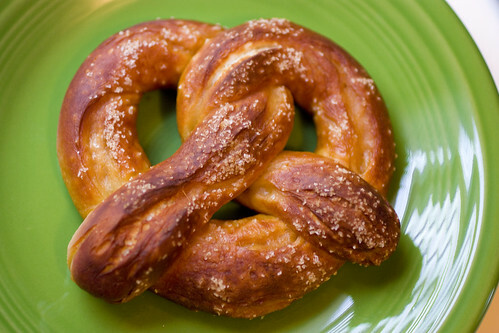 The recipe involves a few steps and lots of time waiting in between, but it's not too difficult if you lose your perfectionist tendencies when it comes to shaping the pretzels. I think we'll definitely be making these again. It's another excuse for us to try out fancy mustard and we're always game for that. And next time we'll get course salt for the top. Along with the pretzels, I also made a batch of these Spelt Walnut Dark Chocolate Chip cookies found on the blog, Food Loves Writing. These cookies are so delicious. 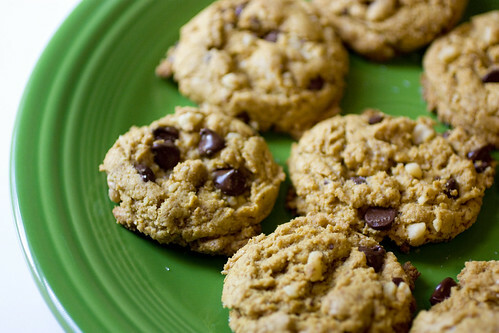 They are thick and chewy and and the sprinkle of sea salt on top gave them just the right amount of kick. I have been devouring the food websites Foodgawker (via Knitter in the Kitchen) and TasteSpotting. These sites show gorgeous photos of food and you click on the link to read the recipe and see more pictures (they even have a crafting companion site, Craftgawker). 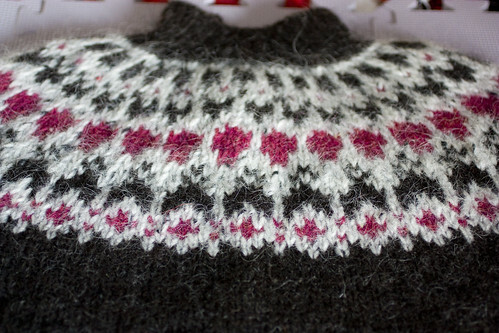 And because I didn't get hot enough baking in 95 degree weather, I've been torturing myself by knitting the yoke of my Icelandic Sweater. 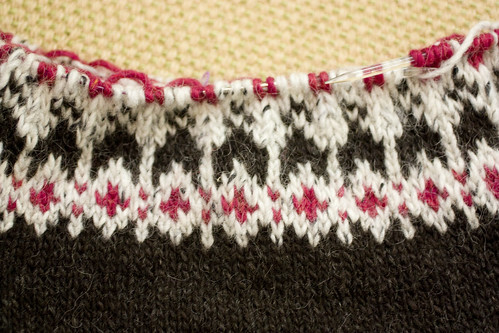 It's so addicting to work each row of the colorwork pattern (and our basement is fairly cool in the summer), so I can deal with the temperature as long as the wool doesn't touch my arms or legs. I have about 15 more rows to go before I get to steek this thing and turn it into a cardigan...I will keep you posted on how cutting my knitting project in half goes. 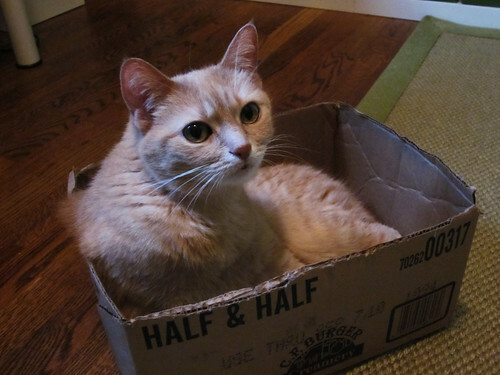 Our little kitties would much rather sleep in a ratty takeout box (our remnants of Thai food on the 4th of July - sacrilege really).